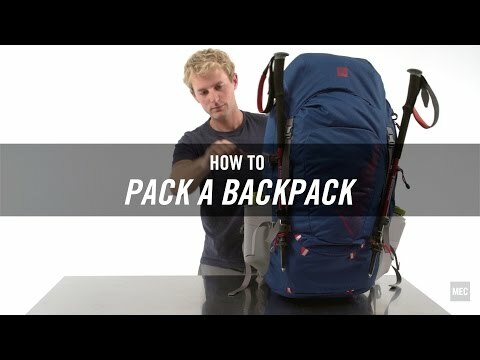 The way a pack is loaded will have a big effect on how it feels on your back. If you just cram everything in without thinking about it, you might feel uncomfortable and unbalanced – plus you could end up unloading your entire pack in the rain to get to a jacket you somehow stuffed at the bottom. Before you start packing, spread everything you plan to take on the floor in front of you. Leave behind the things you may not really need, and remember to include the essentials. If you’re not sure what to take, start with our backpacking checklist or one of our hiking checklists. Make sure your backpack fits you well – it should feel like an extension of your own body. If you have any questions, stop by your local MEC store for help with backpack fitting, or sign up for a backcountry clinic near you. Zone 1: Put light items, like your sleeping bag, at the bottom. It gives structure to the bottom of the backpack and is a solid base for other items above it. A compression sack can help reduce the size of your sleeping bag. Zone 2: Pack your heaviest items, such as your tent, food for meals, water or climbing gear closest to your back. If you’re using a bear canister to store scented items, this is the zone to put it in. Zone 3: Place medium-weight or bulkier items toward the top or down the front of the pack. This will likely be things like extra clothing layers, your water treatment system or your first-aid kit. Your objective is to avoid having a top-heavy pack, which will pull you backwards, or a bottom-heavy pack, which will make you feel like you are being dragged down. Packing heavier items close to your centre of gravity (middle of your back) will keep you balanced and make the load feel more natural. Use your compression straps to bring the load closer to your body and keep everything in place. Distribute the weight evenly between left and right sides. Make sure to spread the load across your hiking group (you can divide up your tent into the body, fly and poles so each person can take one part of the tent). Place frequently used items such as your GPS, map, camera, water bottle, sunscreen or snacks in an easy-to-access place, like side pockets or the top pocket. When you’re hiking on easy terrain, pack heavy items a little higher for better posture. On harder terrain, putting heavy items lower down helps give you better balance. Stuff sacks allow you to quickly pack and unpack your gear and find what you need. Super organized people put each category of items (first aid, kitchen, etc.) in different coloured bags to make them easy to spot. Try not to stuff the sacks full, as a little play makes them easier to squeeze into gaps. Use your pots as hard metal stuff sacks to protect delicate items. Make sure all items that can’t get wet are waterproofed (plastic garbage bags are an easy option), and that all liquids are very well-sealed. Pack your food above your fuel bottle. Many people will lash on trekking poles or their sleeping pad to the outside of their pack, but don’t go overboard – a well-loaded pack should have minimal items hanging off of it.